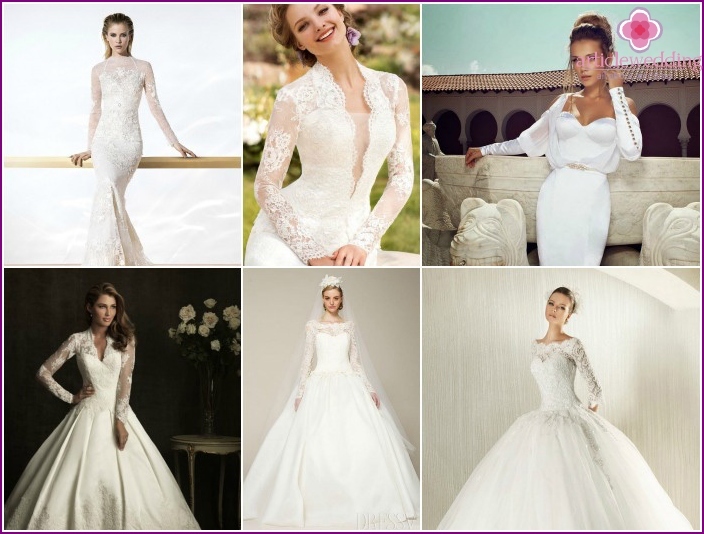 In the late twentieth and early twenty-first centurymany brides are preferring wedding dresses that expose the shoulders, arms and chest area. At weddings it was rare to find closed options outfits. Second-forgotten life decoration with long sleeves gave Kate Middleton in 2011: for her marriage with Prince William watched girls from around the world, who could not help but notice the exquisite attire Duchess. Modest classic image of a beautiful bride revived the fashion of dress, where the hands are covered with lace, satin and silk. Angelic. Apparel such sleeves looks and gentle air, they flared from the shoulder to the wrist. Folded seam, the model of the shape of a right-angled triangle. For tailoring transparent tissue mainly used, which differ from the material of the gown. Style is suitable for straight, narrowed, and for lush robes bride. Balloon. This is a direct wide-diameter sleeve, which ends at the wrist narrow-fitting collar, fastened with a button or hidden hooks. 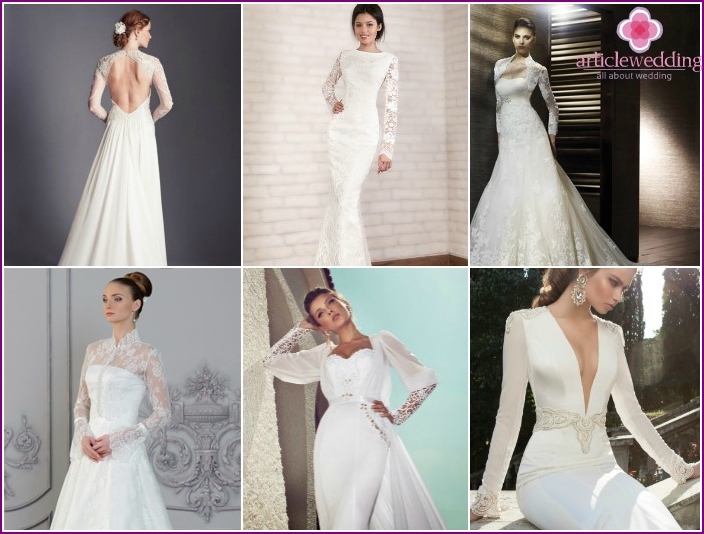 Sewn mostly for summer options for wedding dresses with light airy fabrics. Typically, the balloon is opaque or translucent. "Juliet". This mixture slim sleeves and Boupha (flashlight, balloon). The latter can reach the middle of the shoulder or the elbow, and then tapers to the wrist. Lush upper part can be separated from the bottom tight ribbon, tape, insert a different fabric. Basically, "Juliet" sew using heavy fabrics. Dolman (Hungarian). In the cut, a style reminiscent of a narrower "Bat", where from the elbow to the wrist extends fitting part. 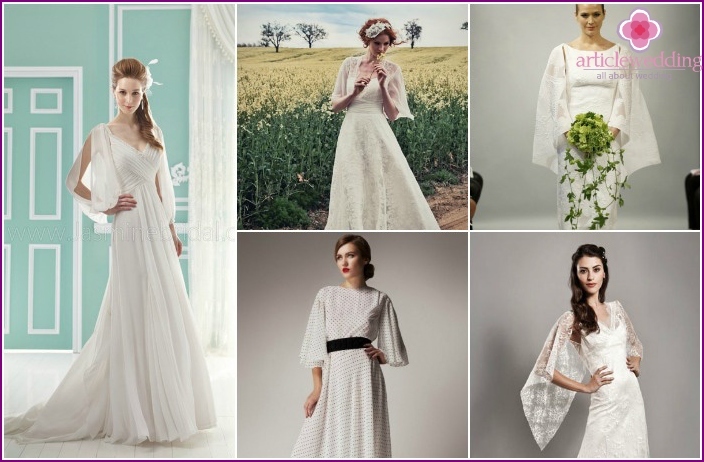 Designers use "dolman" when sewing knitted outfits everyday, but sometimes it occurs in some models of laconic wedding. Bishop (Bishop's). Long, wide, slightly flared to the bottom of the style. Sleeve ends with a narrow collar, button-down or hidden hooks. The fabric for the main part may be transparent, translucent. For tailoring used air, lighter materials, but the collar is sewn using a dense, sometimes contrasting fabric. Often, the lower part is decorated braid or tape, depending on the style of the dress. Gutter. Beautiful narrow sleeves, the length of which usually reaches the wrist. Sewn without cuffs. As a material used lace, thin transparent or translucent tissue, which can be embroidered with small beads, sequins, decorated with sequins and beads. This style will suit a girl with the perfect shape of hands, and too wide or narrow shoulders accentuate unprofitable. Gigot ( "ham"). It is a semi-circular puff on his shoulder, which smoothly into the tapered sleeve to the bottom, ending wide cuff. The upper part is decorated with folds. Sam "ham" is sewn using a dense opaque tissue. Ideal girls selected as festive decorations wedding dress with a jacket. Kimono. The shape reminds of the classical kimono - is a single cut style, flared towards the wrist. For tailoring usually used, silk or other light, airy material. Ideally suited to the image of the bride in oriental style. Bell. Casual, comfortable, gradually expands from the shoulder to the wrist, is shaped like a large bell. Able to hide figure flaws, such as broad shoulders, and a special form of distracting attention from too lush hips culprits celebrations. Toupee. Long, free, it ends with a wide cuff option. 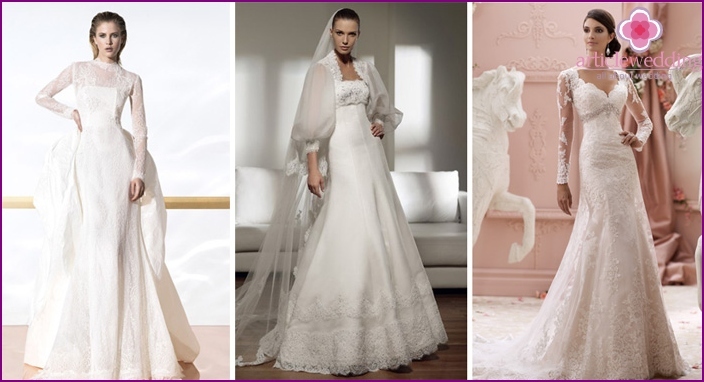 From the elbow begins to fall flared, forming a kind of bag, mid-thigh, knee or to the floor - depends on the wedding dress. With a cut. 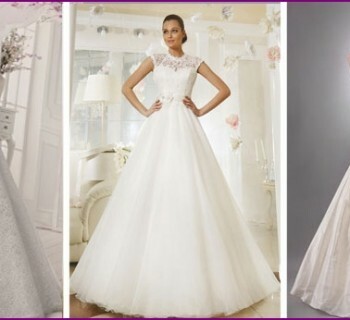 Sometimes designers are not left sleeve stitched along the seam from shoulder to wrist, sometimes there are two cut - between the shoulder and elbow, between the elbow and the bride brush. Attached to the wrist using a tape, tape, rubber bands, cuff, perfect for summer celebrations. 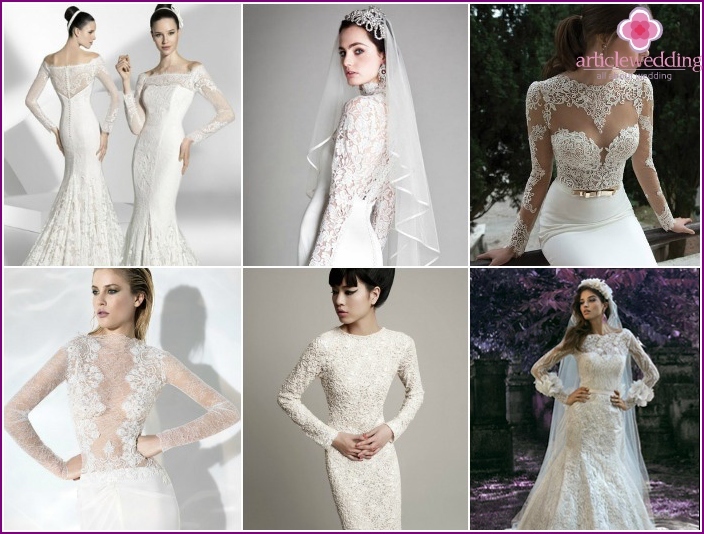 If the bride - the owner of the ideal form of handsand shoulders, it is suitable long mesh tube that can be embroidered with crystals, beads, decorated with openwork lace or exquisite pearls. This model is able to hide the flaws associated with problematic skin - freckles, birthmarks, rashes. Often, this sleeve is sewn together with a closed bodice of the same fabric, creating a feminine, elegant and modest way culprits celebrations. Sometimes used for wedding capes. It may end with a narrow collar or frill-skirt. Long sleeves petals help future wifecreate innocent, delicate and airy look. Style is so named because it is sewn with two scraps of fabric, reminiscent of large plants petals. Typically, designers sew pieces of material-to-shoulder dress, and they are free to cascade down to the bottoms of the bride wrists, or connect them to a neat seam elbow, mid-forearm. This style is perfect for light dresses flared cut, silhouette of a princess, a mermaid or A-line. Tight-fitting arm style, starting flashlight(Bufom), called "Juliet". It was named after the heroine of Shakespeare's plays, which illustrators drew in dresses with sleeves option. 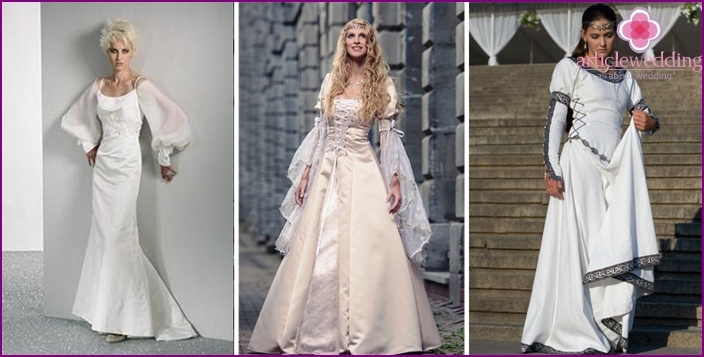 Ideal for a dress that the bride will wear to the wedding in a medieval style, contrasting fabric insert on the buffet only accentuate interesting vintage image. 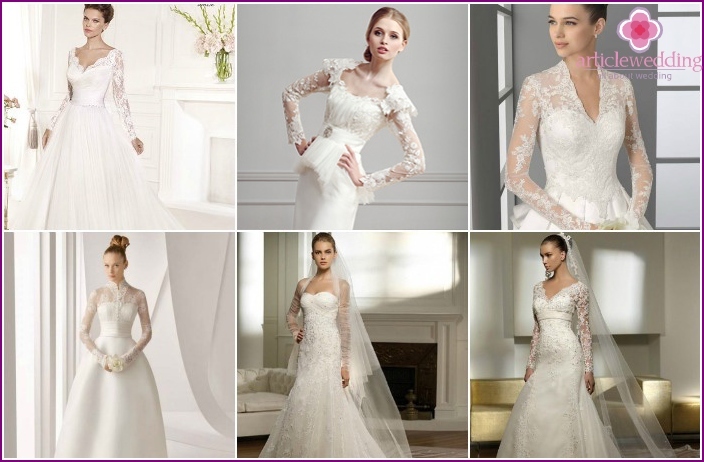 Sleeve-juliet good that hides the fullness of the shoulders, or add volume to them, if the bride is too narrow, thin hands. The ability to feel comfortable in anyseason. 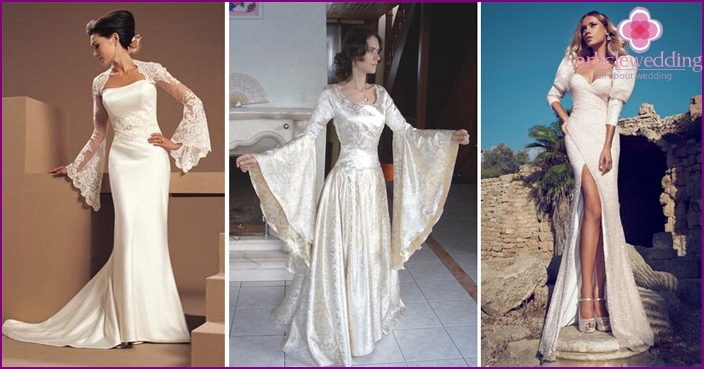 In the summer of the future spouse can choose the light, airy sleeves, petals, made using silk, chiffon fabrics, and in winter the ideal solution would be opaque styles, which designers produced by using a dense satin material. Sleeve length is able to hide or fadingproblematic skin and help balance the appropriate style is too narrow or broad shoulders culprits celebrations. Style is ideal for women who have tattoos, who do not want to show the guests at the wedding event. Long sleeve equally suitable for both younggirls and ladies aged. Transparent sleeve trench-emphasize the beauty of the bride, her slender hands, delicate skin, and the original bottle will focus on the status of the culprit celebrations in age.